Our Movember party last Thursday was a huge success. Thanks for all those who attended. On the night we managed to raise £103. 14 to the Movember cause. 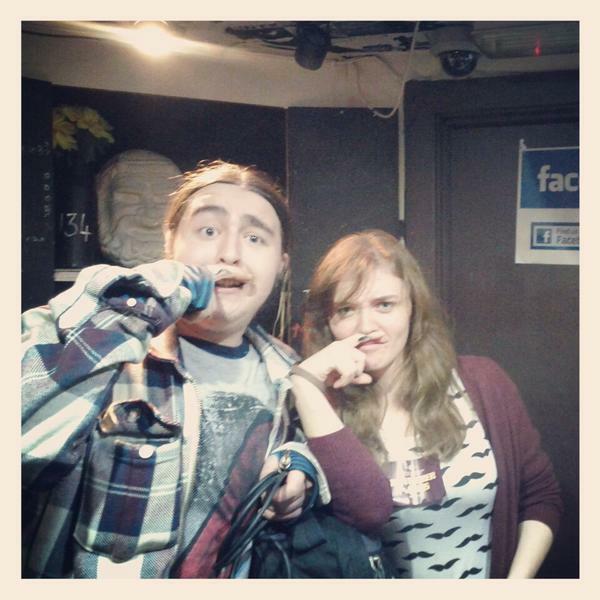 Sam & Sam – Finger-staches! We are now looking forward to our Christmas party! The Christmas gig will take place on FRIDAY 7th December. Place in your diaries and join our Facebook event now! The gig will be the usual time – 7:30 at the usual place – The Royal George. Will post more details soon! We are really looking forward to seeing lots of terrible Christmas jumpers and crazy antlers! Everyone is selling them this year – including ASOS and TopMan for the guys. Are there any Christmas Songs you must sing? Then let us know!